Famous for its numerous whisky distilleries and large populations of birds, Islay is a beautiful island with a dozen beaches and many historical sites. On a clear day you can see over to Ireland. Leisure facilities include a swimming pool in Bowmore, tennis courts in Port Ellen, a golf course at Machrie and diving around some of the many local wrecks. By the way, Islay is pronounced 'eye-la' (you don't sound the letter y). The official Caledonian Macbrayne web site lists the current ferry timetables and fares. Crossing time is approximately 2 hours. Vehicle reservation is required in advance. On Wednesdays it is usually also possible to travel between Oban and Port Askaig. A ferry leaves Port Askaig at 10.40am and reaches Oban at 2.55pm. The ship leaves Oban at 3.15pm and returns to Port Askaig at 7.20pm. The journey is made with a 15 minute stop at Colonsay. If you are going over on the ferry from Kennacraig to Islay and need a place to stay beforehand, Springside B&B is a traditional cottage overlooking Tarbert harbour (just 5 miles from the ferry terminal at Kennacraig) between Loch Fyne and the Mull of Kintyre. Flights are available in light aircraft from Glasgow (35 minutes). Scheduled flights are operated by Flybe. Charters also possible. The airstrip is at Glenegedale near Machrie Bay, 4 or 5 miles from Port Ellen. Prince Charles almost crashed his plane here in 1994. For facilities, etc. visit the Islay Airport web site (telephone number: 01496 302022). Public transport on the island is good. There's a coach and minibus service run by B. Mundell Ltd - tel: 01496840273 - bus timetables. Islay Car Hire in Bridgend (tel: 01496 810 544). D&N Mackenzie at Glenegedale, Port Ellen (tel: 01496 302 300). The Gearach - forest estate near Port Charlotte offering falconry, deer stalking, shooting, kennels. Tel: 01496 850120. Islay Sea Adventures offer wildlife boat trips from Port Ellen Marina. Fishing, diving and private charters are also available. Tel: 01496 300129. Based on Islay, Christine Logan is a private tour guide. 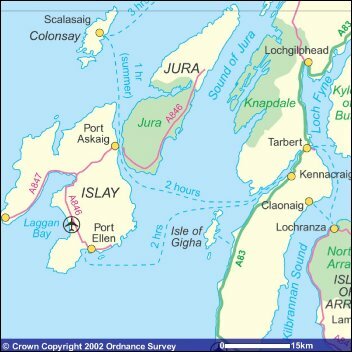 Free tourist map of Islay (downloadable PDF courtesy of The Oban Times). Islay's local newspaper - The Ileach has useful information. Islay's capital has a variety of shops including: supermarket, post office, garage, banks, pharmacy, gift shops, hair dressing salon. In the main square, you will find public toilets and the tourist information centre. Cycle hire available is available from the Post Office (telephone 01496 810 366). An excellent craft/book shop called The Celtic House is in Shore Street. Look out for the Spirited Soaps shop and their whisky soaps. The Mactaggart leisure centre (tel 01496 810 767) has a swimming pool, fitness studio and sauna. Next to it, you can take a tour of the Bowmore distillery which was founded in 1779 and is the oldest on the island. The main street leads from the square up the hill to the famous Round Church, one of only two in Scotland. Legend has it that it was designed so there would be no corners for the devil to hide in. Constructed from 1767 to 1769, the white body of the church is almost twenty metres in diameter with a rectangular tower at the front. The Latin inscription above the door tells us that it was built by Daniel Campbell "to promote truth and honour". The gallery was added in around 1830 and the organ added in 1890. It was Daniel Campbell of Shawfield and Islay who founded Bowmore in 1768. With the streets laid out in a grid pattern, it was the first planned village in Scotland and was part of a resettlement scheme involving people from the old village of Killarow near Islay House (Bridgend). The Columba Centre (Ionad Chaluim Chille Ile) is the Gaelic Language and Heritage Centre just outside Bowmore. The main junction on the island connecting Port Ellen in the south, Port Askaig in the east and Port Charlotte to the west. Look out for Islay House Square which includes Elizabeth Sykes Batiques, Islay Quilters, Islay Studios, Islay Ales (tastings and guided tours of the micro-brewery), as well as a textile conservation workshop, stained glass workshop, coffee shop, cards, gifts, etc. If you take the road from Bridgend towards Port Askaig (see below), you will see the Islay Woollen Mill. The Mill shop is open from Monday to Saturday (tel: 01496 810563). Heading in the other direction, halfway between Bridgend and Port Charlotte, you can turn off the main road and drive to Kilchoman (ruined church and a large carved cross). You can walk from here to pretty Machir Bay. Also on the west coast of the 'Rhinns of Islay' you can see the ruins of historic Kilchiaran Chapel near Kilchiaran Bay. You'll need to take a tiny road from Port Charlotte or Portnahaven to get there. 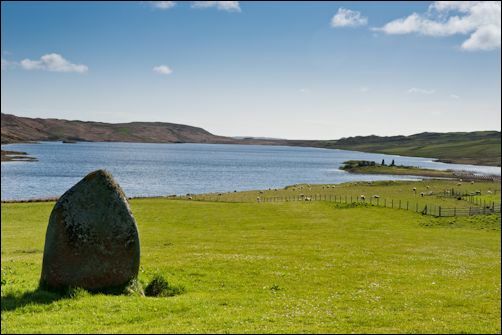 If you are on the Portnahaven to Kilchiaran road, look out for Cultoon Stone Circle on the moorland (near Coultoon Farm) and Tormisdale Croft Crafts (carved shepherds' crooks, hand spun wool, knitwear, etc.). 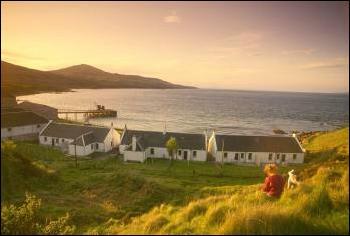 A picturesque coastal village of whitewashed houses where the street names are still in Gaelic. It was founded in 1828 by Walter Frederick Campbell who named the village after his mother. The Port Mor Centre includes a cafe, toilets, showers, laundry, Internet access, meeting rooms and a large children's playground. There is also a campsite for tents and camper vans. Tel: 01496 850441. The Islay Natural History Trust field centre contains a nature library, laboratory, lecture room and exhibitions, housed in the old warehouses of Lochindaal distillery which closed in the 1920s. Ask the staff about any wildlife you may have seen. Open Monday to Friday, 10.30am to 4.30pm. Tel: 01496 850288. 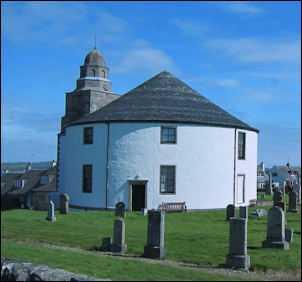 The Port Charlotte Museum of Islay Life is worth a visit if you are interested in the history of the island. Open Monday to Friday from Easter to the end of October, from 10.30am to 4.30pm. Tel: 01496 850358. 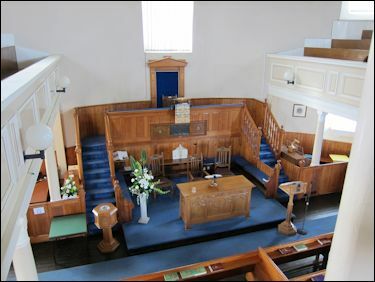 Housed in what used to be the Free Church of Port Charlotte, it contains an extensive library of papers and documents relating to Islay. This museum opened in 1977 and has won several awards. Displays include an illicit still, a farm's medicine box, photos of farming and fishing in years gone by, a selection of toys and exhibits showing life on a croft in the 19th century with numerous old farming implements, tools and kitchen utensils. Also on view are the clockworks from the Rhinns lighthouse. A section is devoted to all the shipwrecks there have been around the island's coast. It mentions the American Memorial, a lighthouse-shaped monument to the 266 servicemen who drowned here in 1918. One troop ship was sunk by a U-boat and a second went down after a collision off the west coast of the Rhinns. The memorial is located on the Oa peninsula (see below). Situated on the east side of the Rhinns in the parish of Kilchoman. Today there are just a few farmhouses at Nerabus. In 1850 there were 14 dwellings and a chapel thought to have been dedicated to St. Columba. In the old cemetery ancient carved gravestones dating from the 14th and 15th centuries were recently discovered under a row of turnips. Also by the sea, sit the ruins of an old mill. A picturesque little village with white cottages sitting around the harbour and a tiny stretch of beach. The ideal spot for seeing seals. There's a general store and Post Office here. Bus terminus. An Tigh Seinnse pub serves good food. A few hundred metres offshore, a couple of low-lying islands form a natural harbour wall. Orsay is the larger of the two. 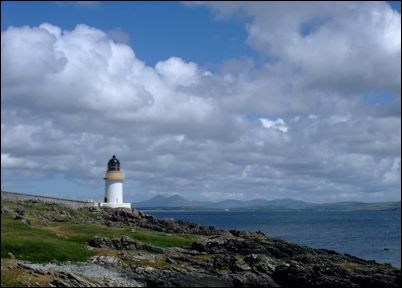 On its grassy top, the ruins of a chapel are dwarfed by the Rinns lighthouse built in 1825 to a design by Robert Stevenson. In the museum at Port Charlotte I believe there is an early Christian carved stone dating from the 6-8th century which was found here. To the left of the harbour, behind the houses, a road runs around to Port Wemyss. Directly overlooked by Orsay, it appears to be more like an extension of Portnahaven, a sort of little sister. In fact both were planned 19th century villages. Robert Pollock has produced an excellent guide covering the stone circle 6km north of Portnahaven. This is a small ferry port on the eastern side of the island with a few shops, a restaurant and a cafe. Bowling, tennis, putting also available. Mactaggart Community Cybercafe (closed Sundays) and The Corner Kitchen (open 7 days a week) can be found at 30 Mansefield Place. It was founded in 1821 by Walter F. Campbell who originally named it after his wife as Port Ellinor or Eleanor. Later this was shortened to Port Ellen. There are regular Arts & Crafts markets in Port Ellen at the Columba Hall in Frederick Crescent. Usually on Thursdays from early May to early October. Also some Saturdays in November & December. On Tuesdays during the summer, the market is also at Bruichladdich Hall. Check their web site for details or phone 01496 850146. The Laphroaig Distillery near Port Ellen offers tours Mondays to Fridays (booked required - tel 01496 302418). Usually closed for maintenance in July and August. Other attractions nearby include the ruins of Dunyvaig Castle which are situated in Lagavulin Bay, not far from Lagavulin Distillery. Emergency repairs were carried out in 1998 by the castle's owners (United Distillers) with a grant from Historic Environment Scotland. Care should be taken when visiting. 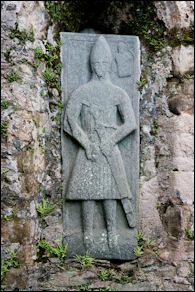 Once a stonghold and naval base of the MacDonald Lords of the Isles, the castle had a turbulent history - belonging at various times to the MacIans of Ardnamurchan, MacDonalds and Campbells. Robert Pollock has produced an excellent guide with diagrams covering the standing stone just outside Port Ellen and another one close to the town at Kilbride. If you take the road out of Port Ellen towards the Mull of Oa, look out for a left turn to Kilnaughton beach and from there you can walk on a signposted track to the 'Singing Sands' and Carraig Fhada lighthouse. This peninsula to the south of Port Ellen is a peaceful escape with sandy beaches, a solar-powered lighthouse, deserted villages and an Iron Age hill fort. 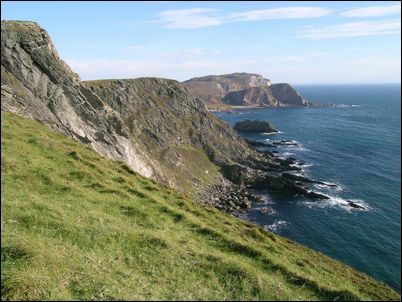 The Mull of Oa is home to the American Memorial (see description above in the Port Charlotte museum section). Big Strand (7 miles long) is the longest stretch of sand on Islay. The RSPB bird reserve helps to encourage the rare chough. For more info visit IslayInfo. Why not stay here at Coillabus Cottage which is available for self-catering holidays. Ideal for families as it sleeps up to 6. 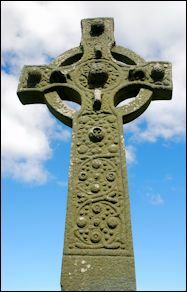 Located 7 miles north of Port Ellen, the chapel has one of the best examples of an early Christian cross in Britain (dating from the late 8th century). This small village on the northern side of the island is where you catch the ferries to Jura and the mainland. There's not much here except the hotel, lifeboat station and a post office in the general store where you can also buy petrol. Boat trips are operated between April and November by Islay Marine (tel: 01496 850436). Just outside Port Askaig (near the road to Bunnahabhain distillery) is a farm which is home to Persabus Pottery (tel: 01496 840243). Located a few miles south of Port Askaig. Archaeological dig around what was the ancient seat of the Lord of the Isles in the 14th and 15th centuries. There are 2 islands on this site - Eilean Mor (Big Isle) and Eilean na Comhairle (Council Isle). 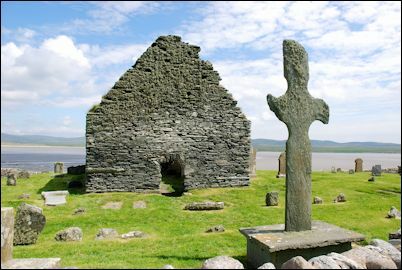 On the so-called Big Isle there are two main ruins (a chapel dedicated to Saint Finlaggan and a service building), plus the remains of over 20 buildings one of which was a great hall. Carved gravestones were found near the chapel. The visitors' Information Centre is open during the summer months (closed November - March). Tel: 01496 840 644. 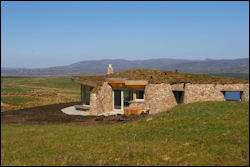 Visit The Finlaggan Trust web site for more details. Ten crannogs (ancient loch dwellings) have been surveyed by Mark Holley. The Gruinart Reserve occupies most of the north-west quadrant of the island and has a Visitors' Centre situated in the middle of a farmyard. Several of the barns have been converted to house video cameras which you can operate by remote control from the first floor of the Centre. It also had some high-power binoculars and a register of all the birds seen by visitors. Further down the road is a wooden hide overlooking the tidal Loch Gruinart. Tel: 01496 850505. Islay is particularly famous for the large numbers of geese that come here. You are also likely to see oyster-catchers around Islay's coastline. They are black and white, with long orange beaks and make a lot of noise. Colonsay is a beautiful little island with many sandy beaches. It's well worth a trip from Islay if you have a day to spare. On Wednesdays during the summmer, it was possible to spend 6 hours on Colonsay by taking advantage of the ferry times. A ship leaves Port Askaig at 0940 and reaches Colonsay at 1050. It goes on to Oban and then returns to pick people up at 1650 when it takes you back to Port Askaig for 1825. I believe that minibus tours of Colonsay can be arranged for about 3 pounds if you buy a ticket at Kennacraig, Oban or Port Askaig. The journey over there on the Cal Mac ferry is quite interesting. When I went I'm sure I saw an otter and what I think were porpoises or possibly dolphins. So keep your eyes on the sea's surface. If you want to stay on the island (you have to plan your time around the ferry schedules), full information is provided on the official Colonsay web site. Jura is a wild, scarcely-populated island. George Orwell wrote his novel 1984 here. You can take the 5-minute ferry from Port Askaig. For information on Jura, click here. Ardbeg (Port Ellen) - telephone 01496 30 22 44. Established in 1815, bought by Glenmorangie in 1997. Tours, Visitor Centre and Old Kiln Cafe. Open all year. Pre-booking advisable for tours (maximum 10 per group). 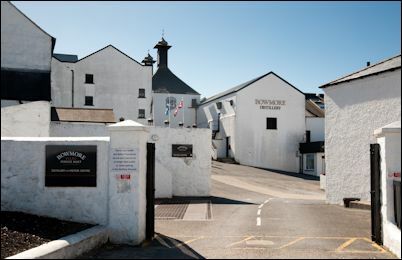 Bowmore Distillery - telephone 01496 810 671. The oldest distillery on Islay. Open all year. Facilities for disabled. Gift Shop. Bruichladdich Distillery is on the road to Port Charlotte. Closed in 1993 but reopened in May 2001. Guided tours - open all year (booking required). Tel: 01496 850 190. Shop open Monday - Saturday. Bunnahabhain Distillery (north of Port Askaig) - telephone 01496 840646. Gift shop. Tours available Monday to Friday. Advance booking required. Caol Ila Distillery (1 mile from Port Askaig) - telephone 01496 302769. Open all year. Guided tours available (prior booking recommended). Gift Shop. 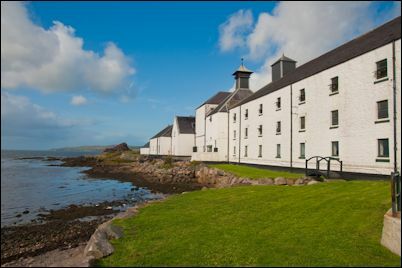 Kilchoman Distillery (Rockside Farm, Bruichladdich) - established in 2005 and the first to be built on Islay since 1881. Tel: 01496 850011. Guided tours. Visitor Centre and Cafe. Open all year. Lagavulin Distillery (near Port Ellen) - telephone 01496 302749. Visitor centre. Guided tours. Booking is advisable but not essential. Open all year. Laphroaig Distillery (near Port Ellen) - telephone 01496 302418. Open all year (closed at weekends in January and February). Guided tours. Visitor Centre. Ecoluxury guest dwellings for 2-4 guests. Opened in summer 2012. Architect designed, turf-roofed, stone-clad cottages. Situated on the Mull of Oa. 4 miles from the village of Port Ellen. Panoramic views across the island. golf, whisky or wildlife break. Unspoilt scenery, birdlife and flora. Shortlisted in the Highlands & Islands Tourism Awards 2015.
each with ensuite bathroom (double ended bath & walk-in shower). Each cottage has its own sauna and hand-made cedar hot tub. sheep's wool duvets and free range goose down pillows. Caithness slab and real oak floors heated by air source technology. Holistic Therapies and a Chef Service also available. Prices from £995 - £1700 per week. Short breaks available see web site. Availability calendar & online booking. 1 well-behaved dog welcome at An Cnocan Dubh lodge. Located on a working hill farm on the Mull of Oa. Sea views and peaceful surroundings. Close to beaches, distilleries, nature reserves and Celtic sites. Ideal for walkers & cyclists. Fishing permit available on nearby freshwater lochs. Drawing / painting outings can be arranged with a local artist. Birdwatching tours available with local expert. 10 minutes from Machrie Golf course. 1 double, 1 twin and 1 family room. 1 bathroom. board games and bookcase (no TV). electric cooker, fridge, freezer, microwave, washing machine. Small garden room leading onto pebble terrace. includes electricity, bedlinen, towels and a supply of logs. Two person discount may apply. Off season short breaks (3 days minimum). Port Mor is a community-run campsite next to the beach within a easy walk to the village of Port Charlotte. Open all year for both tents and camper vans. Port Mor has ample parking, a cafe, toilets, showers, laundry, Internet access, meeting rooms and a large children's playground. Tel: 01496 850441. Kintra Farm - camping and caravanning pitches available from April to September. Tel: 01496 302051. Port Charlotte Youth Hostel has 30 beds in a variety of rooms (sleeping from 2 - 7). Open April - October. Tel: 01496 850 385. Map Ref: O.S.60 (GR 259584). Ayen Cottage is a small family-run B&B by Ballygrant, 5 miles from Port Askaig. Contact Barry and Carole Jurd. Tel: 01496 840270. Bridgend Hotel - situated in the centre of the island - offers 11 ensuite bedrooms (single, double, twin, family). Lunch and dinner are available in the dining room. Bar meals are also served in the bar and lounge in the evening. Tel: 01496 810212. 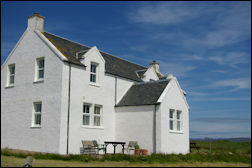 Kentraw Farmhouse offers luxury B&B accommodation near Bruichladdich with views over Loch Indaal and the hills. Tel: 01496 850643. Lyrabus Croft House is a B&B with ensuite rooms at Gruinart, 3 miles from the villages of Bridgend and Bruichladdich. Tel: 01496 850 374. Octofad farm guest house between Port Charlotte and Portnahaven. The Old Excise House (in the former home of the Excise Officer for Laphroaig distillery) offers luxury B&B in 2 ensuite bedrooms. Golf tuition is available from your host. Tel: 01496 302567. Oystercatcher B&B in Port Ellen can offer double / twin / family bedrooms. Scottish Tourist Board 3 Stars. Self catering apartment also available. Tel: 01496 300409. Port Askaig Hotel - a family-run hotel with 8 bedrooms, restaurant and bar overlooking the pier. Sornbank in Bridgend has 3 bedrooms for B&B. Tigh na Sui is a B&B in Lagavulin. Contact Dot & Don Bowness. Tel: 01496 302483. The White Hart Hotel in Port Ellen. 26 Shore Street is a modernised, traditional cottage in Bowmore, overlooking the harbour. 3 bedrooms. Cross House West is on the shore of Lochindaal, 1 mile from Bridgend. 3 bedrooms. Hawthorn Cottage is a 1-bedroom cottage situated in the quiet village of Keills, approximately 1 mile from Port Askaig. Lyrabus Croft Cottage(3 bedrooms) is near the RSPB Nature Reserve at Gruinart. Newhouse in Bowmore is a traditional holiday cottage with 2 bedrooms, sleeping up to 6. 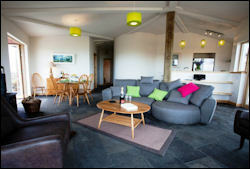 Octomore Farm Cottages - choice of 2 self-catering cottages at Lochindaal. Port Charlotte Hall has been renovated to offer 3 separate luxury self catering apartments. Two apartments sleep up to 8 (4 bedrooms), and the other apartment sleeps 2. Sornbank offers a choice of 2 self catering flats in Bridgend. Sound View is a self-catering house in Keills, near Port Askaig. Taobh na Mara is a 2 bedroom stone cottage on the shore of Lochindaal at Bowmore. 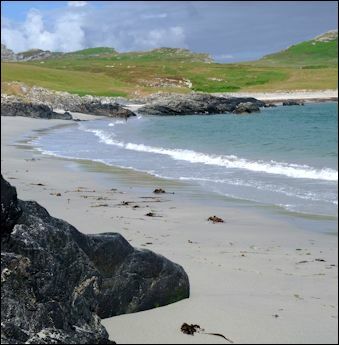 Tighcargaman offers self catering cottages in Port Ellen. The Smithy - 5 star luxury self catering accommodation with 3 bedrooms (originally the blacksmith�s shop in Bruichladdich village). Written by Norman S. Newton this is a lovely glossy colour guide with over 100 pages of photos. It covers the local heritage and culture of Islay, distilleries, birds, landscape, history of settlement, Lords of the Isles, ancient monuments, place names, places to visit, etc. Even if you don't get chance to buy it before you go, you will certainly want a copy for a souvenir when you have visited! This 246-page paperback guide book lists all the places of interest on the 3 islands with detailed location maps and sketches. Published in June 2001. Paperback. 192 pages. Published February 2003. The Landranger Map for Islay is produced by the official Ordnance Survey and is *the* map to have if you are walking, looking for the site of monuments, etc. Excellent scale at 1.25 inches to the mile (2 km to 1 cm). Islay Guide by Armin Grewe - info, photos, walks, blog, links, etc.